We’d love your help. Let us know what’s wrong with this preview of Drawing Down the Moon by Margot Adler. To ask other readers questions about Drawing Down the Moon, please sign up. Recommends it for: Don't read this ('86) edition. Get the '06 version. A clearly written history of paganism in America, including witches, druids, heathens and the whole ungainly lot of us. The book was first published in 1979, and has undergone a couple major updates. I could wish that the revisions were better incorporated, but it would be almost impossible to keep up with the rate of change in the pagan community. She's made a fair attempt to keep current; still, half the internet links I looked up are now defunct. Some of the groups she covers in-depth sound p A clearly written history of paganism in America, including witches, druids, heathens and the whole ungainly lot of us. The book was first published in 1979, and has undergone a couple major updates. I could wish that the revisions were better incorporated, but it would be almost impossible to keep up with the rate of change in the pagan community. She's made a fair attempt to keep current; still, half the internet links I looked up are now defunct. Some of the groups she covers in-depth sound pretty obscure and eccentric to me. Feraferia? Never heard of it before. She's made an attempt in this edition to catch up on bigger trends, like internet groups and the growing number of solitaries, but I'm hoping that some day she does a real rewrite, to bring this ambitious work truly up to date. The style here is journalistic and business-like. There's a little personal history as well. It's important to get the most currently updated version. I found the references section to be one of the most useful. It's not a "how to" book, or a B.O.S, it's more of a social study of paganism, the culture, history, beliefs, etc... It's definitely a worthwhile read, but it can be a difficult read. There is a lot of useful information to be found in it. As I said before, definitely get the most updated version you can find. This book is a classic, written in the 1980’s and has had several editions put out later. Due to the age of the book there may have been many developments in the Pagan arena , so some of the information might still seem dated. The authoress herself passed away on July 28, 2014. Since Gerald Gardner birth the modern witchcraft revival, the Witch Craft Pagan community has grown by leaps and bounds. The most popular facet of the Pagan movement is the growth of Wicca, Gerald’s child. The face of the This book is a classic, written in the 1980’s and has had several editions put out later. Due to the age of the book there may have been many developments in the Pagan arena , so some of the information might still seem dated. The authoress herself passed away on July 28, 2014. Since Gerald Gardner birth the modern witchcraft revival, the Witch Craft Pagan community has grown by leaps and bounds. The most popular facet of the Pagan movement is the growth of Wicca, Gerald’s child. The face of the craft has changed a lot since it’s inception, especially here in America. Using interviews and research Margot Adler gave us an accurate picture of the Pagan movements growth. In the beginning Wicca centered around the God and Goddess and one had to be initiated into a coven in order to practice. Once the craft moved over to the United States of America things began top change radically. The first change as marked by the Susan B. Anthony Coven founded by Z Budapest represented the feminine version of the craft which is wholly Goddess centered. This is called Dianic Wicca. In terms of participation Wicca and Paganism have become les coven centered and more festival and group oriented. There was also a movement away from tradition towards being eclectic but now that is reversing. The book not only covers the current trends in Wicca but also covers the history of witches and how people perceive them. The most noted controversy regards the birth of the craft. Some people say that Gerald made it all up and that there were no witches stretching back to the beginning of time. Some like Margerite Murray feel that it was around. In ancient sources there are mentions of Witches working Hekate and ISIS. Practitioners like Isaac Bonewits feel that there may have been pocket of groups that worshipped the Goddess, but not certainly all of them. The medieval witches may have been a figment of the inquisitors imagination. In any case there are three types of witches. The first type of witch is the Family Traditional Witch. Many of these are non coven based and very individualistic. Their practice is not entirely pure as it has been contaminated with modern ideas. The second type is the gothic witch who model themselves after the Inquisition witch. The third is the modern Wiccan. In terms of Wiccans there are many branches or schools. The first is obviously the Gardnerians and then the Alexandrians. But there have cropped up other types like the Algards which combine the first two. There are also Georgians and they have their own way of doing rituals. Other orders that are new creations have popped up in San Francisco like the New Order of the Reformed Golden Dawn. One of it’s founder Aidan Kelley has since moved back to Catholocism. He believes the Goddess most pof the Pagans are worshipping is actually the Virgin Mary. She has the compassion. In addition to covering witchcraft there is also coverage of Druidic and Egyptian orders in the Pagan Sphere. Some have found their own path to the Gods like the Church of Aphrodite and Ferfaria. The Church of All Worlds was creted with inspiration from Stranger in a Strange Land. By and large Pagan if they wish to call themselves tend to be rather well educated city dwellers who have a strong ecological bent. Many will want to use the term witch due to negative connotations while other’s wish to reclaim the word. Some believe in secrecy to avaoid trouble while others are out in the open about things. This is the 2006 revision of a book I first read in 1984. It's a book that stayed with me in the back of my head through thirty odd years of spiritual dabbling and wandering and, given where I am now, has an additional fascination. What strikes me most is how the tone of the book feels so much more personal than it did when I was 22. It's not an academic tome (though the research is thorough, the biases are clearly and reflexively pointed out and Adler goes to great trouble to present alternativ This is the 2006 revision of a book I first read in 1984. It's a book that stayed with me in the back of my head through thirty odd years of spiritual dabbling and wandering and, given where I am now, has an additional fascination. What strikes me most is how the tone of the book feels so much more personal than it did when I was 22. It's not an academic tome (though the research is thorough, the biases are clearly and reflexively pointed out and Adler goes to great trouble to present alternative points of view). Today, I'd say it's a useful counterpoint to Ronald Hutton's The Triumph of the Moon, offering the US version of neo-pagan history but with an insider's access. It's also full of common sense and good humour. Adler values the absurd and no time for power trips. If I feel she's sometimes a little kinder than she needs to be, that's probably my own bias showing through. This gets 5 stars for influence. A couple of years prior to this read I had a spontaneous spiritual emergency as I came out of a meditation sitting in the sand at Alki Beach in Seattle. I was familiar by this time with Starhawk and Reclaiming and had met people at the pagan bookstores and had taken a class or two with some pagans. This book was a matter of fact reading about who's who in the pagan subculture, some history and an introduction to paganism in general. I liked that it was a survey of a This gets 5 stars for influence. This book was a matter of fact reading about who's who in the pagan subculture, some history and an introduction to paganism in general. I liked that it was a survey of a number of paths. I started to get the sense of pagan life as a "normative" place/space. For some reason this was important to me at the time. The info is dated by now but it was a great intro to the evolution of neo-pagan community. In that same I met the pagans at the Unitarian Universalist Church north of the UW in Seattle and I joined their pagan group CUUPs and would support that venue for the next 10 years. This kinda felt like reading an NPR episode, which is fitting because Adler was a host. Sometimes the book dragged, but there were some really intriguing parts of the book, I particularly liked Adler's reflections, and the reflections and opinions of Devlin. I read the most recent edition of Drawing Down the Moon, and I'm glad I did, as it would have been really out dated had I read a second hand edition. This edition allows the reader to see where Adler views the craft in 2006, compared to wher This kinda felt like reading an NPR episode, which is fitting because Adler was a host. Sometimes the book dragged, but there were some really intriguing parts of the book, I particularly liked Adler's reflections, and the reflections and opinions of Devlin. I read the most recent edition of Drawing Down the Moon, and I'm glad I did, as it would have been really out dated had I read a second hand edition. This edition allows the reader to see where Adler views the craft in 2006, compared to where it was in earlier editions. An excellent look at alternative spiritual paths in contemporary America that are inspired by ancient pagan practices. When I started looking at Wicca again, this book came up in list after list. It was on lists for beginners and it was on lists for "people looking to get back into paganism." When I started reading about Wicca and the occult way back in 1998 it was on all of the lists and that was before it got an updating. I bought the book and it sat on my coffee table through a pregnancy AND a maternity leave and then it was moved to my bookshelf. It just looked so big and I always have so many books to r When I started looking at Wicca again, this book came up in list after list. It was on lists for beginners and it was on lists for "people looking to get back into paganism." When I started reading about Wicca and the occult way back in 1998 it was on all of the lists and that was before it got an updating. I bought the book and it sat on my coffee table through a pregnancy AND a maternity leave and then it was moved to my bookshelf. It just looked so big and I always have so many books to read. Then I reached a point when I realized that I really DID want to start studying again. I went back to the beginning and read the first that got me interested in the craft. Then I read a book off the suggested reading from that book. Then I decided that there was nothing to it but to do it and I grabbed up this massive tome and took to reading 10 pages a day very patiently. Adler does a phenomenal job with this book. It could use another update, just because things go so fast now, but it was full of all kinds of information. This book isn't necessarily aimed at the seeker and it gives a nice history of the Neo-Pagan movement. Here were names that I recognized from my days hanging around the new age section in the B. Dalton and explanations of their backgrounds and beliefs. Adler looks at a few of these different traditions and religions and there were some I had never heard of that fascinated me into rabbit holes. A relatively casual participant-observer investigation into neo-paganism and new age spirituality in the Western world. First written in the late 1970s, republished twice with updates. I read the 2006 updated version. I think it was very helpful in understanding how neo-pagans and Wiccans conceptualized themselves, their spiritualities and histories at the times this book was written and updated. Very good insights on this front. But I think that is perhaps where the usefulness ends, as I think A relatively casual participant-observer investigation into neo-paganism and new age spirituality in the Western world. First written in the late 1970s, republished twice with updates. I read the 2006 updated version. But I think that is perhaps where the usefulness ends, as I think Adler never successfully leaves the perspective of her participant status, nor her whiteness. I really enjoyed this book and became inspired by some solid arguments for a case against monotheism, which I hope to use to help produce a sound theory around. One thing I found interesting was that Margo Adler supports the idea that monotheism, as a minority practice, has been with humanity since the inception of religion. I was really surprised how much of the Wiccan myth I didn’t know about. Authors like Margaret Murray and works like Aradia were unknown to me before I read this book. I didn’ I really enjoyed this book and became inspired by some solid arguments for a case against monotheism, which I hope to use to help produce a sound theory around. One thing I found interesting was that Margo Adler supports the idea that monotheism, as a minority practice, has been with humanity since the inception of religion. I was really surprised how much of the Wiccan myth I didn’t know about. Authors like Margaret Murray and works like Aradia were unknown to me before I read this book. I didn’t realize that the seeds of Wicca were planted in the Late Modern Era at the beginning of the twentieth century. I found it so true that notion of ‘finding your home,’ in spirituality that margaret talks about in the section, “A religion without converts.” At least this was so in my experience. I also enjoyed the section iterating through the various Traditions and learned of more pagan traditions such as the 1734 trad, various Dianic cults, & NROOGD. I share some of the sentiments expressed by the various people discussed in this book, that our ecological problems are mainly the result of an unhealthy religious worldview, relating back to my thoughts on monotheism and dualistic thought introduced by the Zoroastrians. I was kind of shocked that OBOD and other forms of Druidism weren’t mentioned anywhere. I read attentively all the parts that related to Isaac because I’m a bonewits fan-boy. Edward Fitch was mentioned throughout the entire book which is kind of cool because he is active in our local pagan community. I kept teasing him about being famous and quoting the words from the book to others at gatherings and meetups. That little was mentioned of ADF disappointed me, though Isaac was a member of RDNA, it doesn’t mean that the parts about ADF belonged in the section discussing religions of play. I highly enjoyed the part about Heathens and Asatruars, however, I think the few people quoted from the Asatru Folk Assembly were indeed racist and she could have sought out others to talk to. No mention of Celtic Reconstructionism upset me quite a bit more than little mention of ADF. The reconstructionist religions she did mention were either dead or worthless in my opinion. She didn’t mention Hellenismos either. This was a good overview of modern paganism, I think, but I am using the term modern relatively. It's true, she did update the book in the 2000s, but most of the information in the bulk of her chapters was from the seventies with only minor updates at the end about how things were totally different now. I feel like as highly as this book was recommended, there really needs to be something similar done that truly is modern, not from decades ago. It just isn't accurate anymore. A problem I have wit This was a good overview of modern paganism, I think, but I am using the term modern relatively. It's true, she did update the book in the 2000s, but most of the information in the bulk of her chapters was from the seventies with only minor updates at the end about how things were totally different now. I feel like as highly as this book was recommended, there really needs to be something similar done that truly is modern, not from decades ago. It just isn't accurate anymore. A problem I have with some other authors I've read on this subject is that they tend to let their own religious views cloud their judgment and Wicca/Witchcraft/What-have-you can do no wrong, but I like that Adler addressed that there is a problem of exploiting native peoples and other culture's religious practices. I was also very excited that she said she'd talk about how diverse the Pagan community was, but all she did was mention Voudoun and Santeria a few times before only ever quoting and studying white people. That was kind of a bummer, and really only sort of enforced the idea that people of color aren't involved. That just sort of left a sour taste in my mouth. Maybe not the best book if you are completely new to the Wicca, Pagan movement. Although a thorough investigation into the world of Pagans in America, the book can be hard to read and hard to keep up with. Although, as the book states in many cases, it may simply be that the movement is really hard to clarify, with tons of different branches, rituals, beliefs and rules. Having said this, the book is definitely worth reading if you want to get an idea of what’s out there, or at least where it sta Maybe not the best book if you are completely new to the Wicca, Pagan movement. Although a thorough investigation into the world of Pagans in America, the book can be hard to read and hard to keep up with. Although, as the book states in many cases, it may simply be that the movement is really hard to clarify, with tons of different branches, rituals, beliefs and rules. Having said this, the book is definitely worth reading if you want to get an idea of what’s out there, or at least where it started, as the book is a bit outdated and the modern revisions a bit too short for my liking. As far as I understand this is one of the most detailed accounts of the start and history of Pagans and Wiccans in America and it does make an excellent reference book. Maybe I was expecting to get a clearer vision of what it means to be Pagan, but if the book is any indication, it is a very confusing world and for those looking to get a start into it, there are probably better books, if maybe somewhat more specific to one current of thought. Oh my god, I loved this book. So full of information in a fresh light, even for it being 40 or so years old. I learned so much, it opened my eyes and made me feel closer to my Path than ever before. This is something everyone interested in Paganism/Witchcraft or knows someone who is and is unsure of what that other person really means. The unity of disunity is what makes the Craft such a lovely thing, which was emphasized in this book- everyone is different and Paganism gets that, it understands Oh my god, I loved this book. So full of information in a fresh light, even for it being 40 or so years old. I learned so much, it opened my eyes and made me feel closer to my Path than ever before. This is something everyone interested in Paganism/Witchcraft or knows someone who is and is unsure of what that other person really means. The unity of disunity is what makes the Craft such a lovely thing, which was emphasized in this book- everyone is different and Paganism gets that, it understands and celebrates those things that make you unique. Throughout this book, it shows the Republicans, Democrats, Radical Feminists, Radical Faeries, Priest/esses and Computer Technicians who are on the Path. I will be lending this book to all of my friends and family. This is a wonderful book. I learned a great deal that I did not know about Wicca and other Pagan traditions in America. The writing was inspired, the reading was easy, and the whole was a joy. It was truly amazing to follow the development of this spiritual and religious movement through its many phases, to see so many different sides of it and the people who live it and give it life. There is much here for pondering, and though the revised edition was published in 1987, the issues and ideas rais This is a wonderful book. I learned a great deal that I did not know about Wicca and other Pagan traditions in America. The writing was inspired, the reading was easy, and the whole was a joy. It was truly amazing to follow the development of this spiritual and religious movement through its many phases, to see so many different sides of it and the people who live it and give it life. There is much here for pondering, and though the revised edition was published in 1987, the issues and ideas raised are certainly as important, if not more so (with regards to ecology and diversity in particular) now. I really liked that this was written by a journalist. I normally can't take reading new age-y stuff because I feel like it's propaganda. This book takes a truly critical account of Paganism in America during the 70's and 80's. 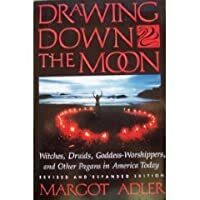 The best part is Margot Adler was not an outsider to the world of Paganism, personal accounts about her own experiences make for a more interesting read. I'd love an updated version! Not only is the book informative and easy to read, it's personable like she was. Drawing Down The Moon encompasses a huge variety of spiritual paths & traditions. Its writing is formed by not only book-knowledge but also personal experience and interviews with people closely associated with each path. I re-read it time and time again. Note: The 2007 version is the most revised. May Margot Adler's memory ever be for a blessing. Merry meet, merry part, and [until we] merry meet again. coming from a christian background, i was amazed at the different categories of alternative spiritualities in this book. was that pc enough? anyways..where else would i learn about a group of men called "radical faeries"! This is a great book and a must read for all Pagans and Pagan wannabes. Even if you have been a Pagan for years this book will teach you something. Very well done by a very respected member of the Mainstream media and Pagan communities. Interesting but pretty vanilla coverage of the topic. It's not going to change your mind if you are pro or con-Wicca. It's not a tell all and is somewhat sympathetic. I read this in the 90's. Margot Adler is an NPR correspondent. This was actually a re-read for me--I first read it maybe 20 years ago, when I had a much different perspective. Because this edition dates to the mid-80s, it is something of a historical document, but still very informative. A starter book for the young among us, a book you learn can be used in many different ways by many different people. I would recommend that it sits on your book. Excellent read on earth religions, feminist & queer spirituality, and ritual-craft. Excellent history of the pagan movement in America through the early 1980s. While Wicca receives a sizable portion of the book, other paths are well-represented. Great resource on the history of modern Wicca.